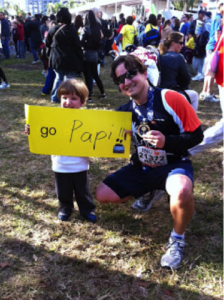 Back in 2008, soon after the birth of my first son, I decided to take up running as a form of getting back in shape. The weird phenomenon that tends to happen to men when their wives get pregnant, actually happened to me. I had ballooned to 40 lbs over my ideal weight. I don’t know if it was her or me getting all the cravings. What I do know is that I was overweight and not proud of how I had let myself go. I decided then and there that I would commit to doing something about it. I looked at my son and knew this little guy was going to be my driving force, my inspiration to achieve all my goals. Right away I knew I wanted to be the dad that would be active, one that could run with him, a dad that could go out and play for hours with him. A dad with no excuses! Coincidentally (if you believe in coincidences) my brother-in-law suggested we try out running since I lived in a neighborhood with a nice running route. 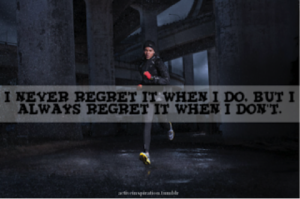 My plan was to begin running one mile a day until I could build myself up to running longer distances. My ultimate fitness goal was to run the 4 mile course around my house, which seemed like a daunting task at the time. I hadn’t run anything close to a mile for nearly ten years, or basically since high school. 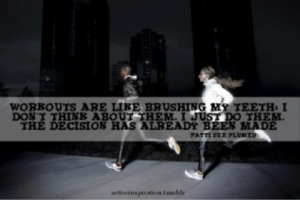 I thought only a crazy person would run for fun or even to lose weight. It seemed like the most boring activity anyone could engage in. At the beginning it was a combination of running and walking. If I remember correctly, we began with 1 minute jogging and then we would walk to 2 or 3 minutes. It took us over 12 minutes to complete our first mile, not to mention, we were beat and needed quite a bit of time to catch our breath. After all the years of playing sports as a kid and throughout high school, here I was panting for air like a dog laying outside on a hot summer afternoon. Seeing myself so weak had an empowering effect on me. At that moment, I recommitted to my goal of achieving a healthy weight and living a healthy lifestyle. It’s not only about starting with commitment, it’s also about recommitting along the way. Recommitting to your goal when you hit a hard obstacle or your doubts begin to creep in. Always remember that your initial commitment may not have enough juice to get you to the finish line, you will have to recommit one or more times before you finally achieve your intended goal. I began running 4-5 times a week and adjusted my diet to introduce more vegetables and fruits while reducing processed foods. This one-two punch helped me lose weight and ultimately gain the endurance I needed to run more miles, while walking less. Fast forward 3 months and I was now able to complete the 4 mile course with an average pace of 10min 30sec/mi. Nothing to write home about for many runners, but for me it was a huge accomplishment. You see, you should never compare yourself to other runners or other people in life. This is the perfect recipe for a life of unhappiness and a life were you never truly feel accomplished. What I did was compare myself and my results to what I did yesterday and the week before. I was trying to be better than I was last week or last year. I wasn’t focused on beating Lance Armstrong in a fitness competition. My goals revolved around improving myself compared to myself, not to anyone else. The key is to keep track of your progress, take notes of your results so that you have something to compare to. You can’t get better if you don’t know how well you did before. This serves two purposes; the obvious one is to help you measure your improvement, or lack thereof, over time. The second and critical purpose it serves is to motivate you to recommit to your goals. Once you’ve seen progress and results, this will inspire you to continue forward and stay committed. Obviously, lack of results can do just the opposite. You have to put in the work in life, no one said this would be a piece of cake. 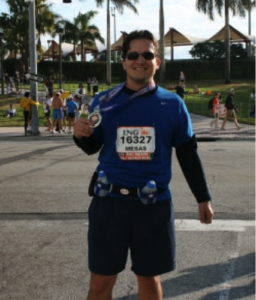 Eight short months after beginning my running lifestyle, I ran my first half marathon (ING Miami Half Marathon 2009). Truly a huge accomplishment for me, given the fact that less than a year earlier I was 40lbs overweight and completely out of shape. It was a goal I had set for myself the minute I ran past the 4 mile mark. The 4-miler was my initial goal but once I reached it, I was hungry to achieve more. Many people reach one goal and then sit on their laurels expecting future achievements to just fall on their lap. My recommendation, once you reach a goal, is to celebrate and enjoy the accomplishment but you must immediately begin to think of your next goal. A goal that will hopefully push you beyond your previous success. With the proper training and commitment, we can all achieve miraculous results. Many important decisions in your life require some form of commitment. To reach any goal you must make a commitment to yourself. You must commit to achieving the best in your life. Use the power of commitment to push you through the obstacles and when the going gets tough, recommit but never ever quit! PreviousPrevious post:Be ConsistentNextNext post:Personal High Five and a Fist Pump!